(From Pentax lens literature) The Pentax DA 21mm ƒ/3.2 AL Limited. Mounted on a Pentax digital SLR camera body, the lens protrudes very little from the camera's front panel, making it an ideal choice for carry-everywhere, instantaneous snapshot photography. There isn't an official definition for a ''pancake'' lens, but it's certainly appropriate to class the 21mm ƒ/3.2 AL as one. At only 190 grams (4.9 oz) and one inch long, the lens/body combination becomes very small and portable. The 21mm ƒ/3.2 AL is a designed-for-digital lens: it replicates a field of view of just over 31mm on a digital body. Built with a smaller imaging circle design, it eliminates the aperture ring, making it more problematic to mount on a film bodies that don't have aperture control. 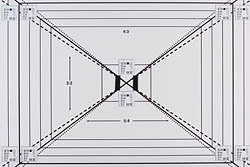 While the glass elements are smaller, there is only the smallest amount of vignetting when mounted on a Pentax film body. The lens comes equipped with an interesting lens hood, takes your choice of either 43mm or 49mm filters, and is available now for around $430. The 21mm ƒ/3.2 AL is a very sharp lens. When set to an aperture of less than ƒ/22, the lens didn't register much more than 1.5 blur units on our sharpness chart. I would put the optimal usage at ƒ/8, where image sharpness is tack-sharp across the whole frame. At ƒ/22, image softness ''degrades,'' probably due to diffraction limiting, to 2 blur units. All in all, excellent performance. Chromatic aberration is handled quite well by this lens, optimized more for the larger apertures than the small. Wide open at ƒ/3.2-4, you see no more than 4/100ths of a percent of frame height in chromatic aberration; this degrades gracefully to 5/100ths of a percent of frame height. These are the extremes, detectable in the corners of the image, but on average, chromatic aberration isn't readily detectable except by pixel-peeping. Corner darkness is evident at apertures set to less than ƒ/5.6. Wide open at ƒ/3.2, you see a light difference of three-quarters of a stop in the corners. This improves to a half-stop difference by ƒ/4, and further to a quarter-stop by ƒ/5.6 and smaller. Being a fixed-focal length lens, distortion is also fixed, in this case at just over 0.5% barrel distortion in the corners. Average distortion is less obvious at 0.3%, and can be easily corrected in image post-processing software. The 21mm ƒ/3.2 AL is a very fast-focusing lens, no doubt influenced by its small size. The lens racks through focus in well under one second, impressive performance for a screw-driven lens. Because it is mechanically driven it does make some higher-pitched noise while focusing; this is really only noticeable when it does a full focus rack. Point-to-point focusing is extremely quick, and much less noisy. With 0.17x magnification, there are better lenses for macro work than the 21mm ƒ/3.2. Close-focusing distance is 20cm (just under 8 inches). Pentax has rolled out the red carpet for this lens. It's very solid, with metal parts where it matters like the mount and filter ring... in fact, I can't say for sure that the whole thing isn't made of metal. Small touches are evident everywhere with this lens. The lens hood is more of a shroud, with a rectangular cutout to match the image frame, and it's made of metal, too. The front lens cover slides on over top of the front of the lens, and while it's not made of metal, it is lined with a velvety finish. 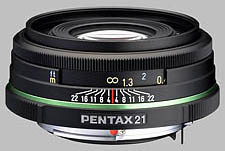 The 21mm ƒ/3.2 is equipped with Pentax's ''Quick-shift'' AF/MF mechanism, allowing the user to override autofocus at any time by simply turning the focus ring. It isn't equipped with a clutch, like some lenses - when you reach the end of the focus track, it stops completely. There's a distance scale etched into the focus ring, as well as a companion depth-of-field scale. The lens being as small as it is, you have to tilt the body towards you to actually see both of these, as the pop-up flash looms over top of the lens. The lens isn't equipped with an aperture ring, as it's designed for Pentax's digital bodies which don't need one, and the presence of one would just add additional and unwanted depth to the lens. The lens is equipped with two filter rings, one in the lens and one in the hood, which allow the user to equip 49mm or 43mm filters, respectively. However, it should be noted that using a 49mm filter prevents the use of the hood. An attached filter will not rotate while focusing. Pentax 20mm ƒ/2.8 SMC P-FA ~$? If you need a similar focal length, you're shooting film and you want to stay loyal to the Pentax brand, this is the lens you need. Unfortunately, we haven't tested it, probably because it's been discontinued by Pentax. We haven't tested this lens, but if you're needing a lens with a bit more speed in this focal length, this would be an option. It is a much different animal however, at over three times the weight (520gm) and taking massive 82mm filters. It's also a full-frame lens. I enjoyed using the 21mm ƒ/3.2 as a walk-around lens on a K100 Super: it's small enough to be extremely portable, fast enough to be very versatile, and tough enough to last. The lens offers excellent results in image sharpness, good resistance to chromatic aberration, and minimal distortion, at the cost of a little bit of corner shading when used wide open. It's a little piece of luxury that does more than look good - it delivers the goods, too. The DA21 is small and the clever lens hood hardly adds to its length. On a K-7 it looks positively diminutive. As with all the limiteds, the design and build exude that certain satisfying precision feel. The lens hood design is unconventional but effective. The lens cap is a solid piece of felt lined aluminium, in keeping with the look and feel of the lens, but a bit impracticable and probably expensive to replace. Fortunately a standard old Pentax slip-on 51mm plastic lens cap fits perfectly. The 21mm focal length is just right on an APS sensor camera, such as my K-7. It is just wide enough to make a difference but not too wide to give that somewhat boring stretched effect of ultra-wides. Autofocus is accurate, quiet and quick - there isn't a great deal of mass to spin around with this lens. Optically, this lens is sharp enough to allow some cropping without a great loss of quality. It is quite sharp even wide open and gets better stopped down. The sweet spot seems to be somewhere between f/4 and f/5.6. There is a fair amount of barrel distortion and some CA, both easily correctable in post-processing. Contrast and colour rendering are excellent. Flare resistance is good, although when shooting into the sun at a certain orientation it is possible to provoke a 'green blob' flare, probably a sensor reflection. Stopped down it gives nice highlight 'starbursts'. The DA21 is inconspicuous enough for street photography and sharp and wide enough for landscapes and architectural shots. A lovely little lens, superb in every way! Could be cheaper, I guess :-)! This is one of the lenses that has made a lot of pros keep their Pentax gear, as it is superbly made, sharp as a needle, and very small. Can't fault it in any way! This lens is the latest addition to my lineup. I purchased it to have a wide option for low light. It will serve MANY more roles than just a low light lens! There's something amazing about this lens (and all limiteds? Maybe, this is my first). It creates a 3D effect on pictures that's hard to describe, but amazing to behold. Playing with DOF can enhance that effect. Colours, saturation and contrast are among the best I've seen, at least as good as the FA 50 macro. The build quality is near perfect, the lens is light, small, but sturdy and reliable. It's fully made of metal, with a nice, small hood, an elegant cap, and the typical quick shift MF function common to all DA lenses. Pentax again impressed me with this lens! This is a beautiful lens. Everything about it is fantastic: it AFs like a charm, it's brilliantly sharp, the closest focusing distance lets you get up close and personal with your subject, its rendering of colour is great... My only problem with this lens is that the fl just doesn't work for me that well. I've been forcing myself to use it more lately, and have already started to warm up to it. I've had my DA 21 for 2 and a half years, and I've not used it enough. Have thought about letting it go a few times, but in the end it always surprises me and it stays in my bag. Aside from the optics, the lens is tremendously well made, aesthetically pleasing in and of itself. I always laugh at my friends who shoot Nikon/Canon, because the limiteds are just so much more aesthetically appealing than their lenses. . The compact size is also brilliant, on my old K100D I had a light, portable combo. Very good all around prime lens. A pleasure to carry and useful in many situations. Although it is pretty sharp, especially stopped down a bit, the 21mm does not have a super fast maximum aperture. 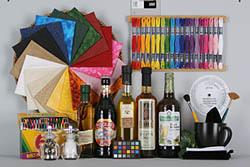 That can be a factor for low light shooting or when trying to get limited depth of field effects. The 21mm also has definite barrel distortion. This can be corrected in Photoshop, but that is not ideal. So there are compromises. Still, this is the lens I leave on my K10D 90% of the time, because of its useful angle of view, its good overall image quality, and its amazing portability and toughness. I can easily shoot holding this combination one-handed at my waist, like a Leica. Or, on the other hand, I can compose carefully through the viewfinder, and correct the lens' barrel distortion in Photoshop (making good use of the extra 5% of image area not visible in the K10D's finder!). some AF accuracy lack, but o nly at wide open! The fact this lens “huge centre sharpness at wide open” falls back really quickly towards the edges and corners, makes it my favourite artistic lens! One stop down and everything is there you need! It’s a must have on travel and street, or candid photography! Because of the focal length, this lens is on my camera more than any other. The lens is really well built, as are all Pentax limiteds. I'm not aware of any other lenses of this focal length that are even close to as small and light as this lens. It makes for a very compact SLR. The lens has quick shift so you can readjust the focal point after autofocus. The lens is somewhat soft at f/3.2, but one stop down (f/4.5) it is perfectly sharp. There are a lot of reports of focusing problems with this lens in combination with K100D/K110Ds, but is seems fine with my K10D. The lens hood is very small, only adding a few mm to thickness of the lens, not that lens flare is a problem with this lens. I never saw any lens flare until I tried to produce it by shooting into the sun. Even then it was barely visible. This is a great lens, but at times I did wish for a faster lens.